Personal Information is collected online when you voluntarily submit non-public personal information on the Sites by requesting information, purchasing our products, signing up for an account or other Services, receiving electronic notices or other similar communications and other similar activities. We may request Personal Information, such as your user name or password, whenever you login to your account and may in limited circumstances ask you to provide credit card information and other personal information when purchasing goods that are offered for sale on our Sites or when making a donation online. We reserve the right to request any additional information necessary to establish and maintain your account. 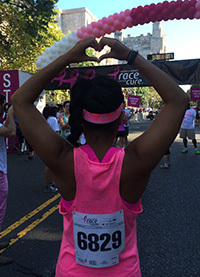 Generally, our uses of Personal Information collected online include, without limitation, responding to your inquiry about volunteering time to Komen, enabling you to make a donation, purchasing a product from the Sites, or providing information, such as sending marketing communications and newsletters. Komen will retain your Personal Information for fulfillment of the intended purposes for which such Personal Information is collected. Komen will establish minimum and maximum retention periods based upon the type of information collected (i.e., sensitivity), the intended purposes and as otherwise may be legally required. We also reserve the right to share, assign or transfer your Personal information to Komen Headquarters and its affiliates, or any successor in interest to our organization by merger, reorganization, or operation of law. In addition, Komen may make your name and postal address available to other non-profit organizations whose services or activities may be of interest to you. Komen may make your name and postal address available to other nonprofit organizations whose services or activities may be of interest to you. If you would like to opt out of having Komen share your name and postal address with those organizations, please click here: Opt Out. Komen has made available the public forums on the Sites so that you may have an opportunity to interact with other Site visitors in order to share knowledge and news or participate in fundraising events benefiting Komen. Since participation in such forums is voluntary, you control what personal information may be disclosed to others. In order to avoid your email address or other personal information from being gathered and used by others for unsolicited, inappropriate or harmful purposes, Komen advises that you should be cautious about posting your email address or phone number or other personal information to newsgroups, blogs, message boards, or other public forums. In addition, access to Personal Information contained in your account is protected by use of a password so keep your password private and secure. Komen wants your account (including without limitation, your Personal Information and preferences) to be accurate and complete. To update or change your Personal Information, visit our user login page and log on to your own account. You can update your Personal Information after logging in to your account.